FX traders went cuckoo after the Swiss central bank threw their clock out the window. It was either a dream come true or a total nightmare to be an fx trader today, after the Swiss central bank shocked markets by abandoning its peg to the euro, causing the franc to surge as much as 28.5% against the single currency. Not exactly your usual morning’s trading, given currencies tend to shift less than 1% in a day. The franc had been pegged to 1.20 against the euro since 2011, but fell off the proverbial north face of the Eiger to as low as 0.8591 after the surprise announcement. It is currently trading around 1.026 – still almost 15% down. The Swiss currency also fell almost 14% against both the dollar and the pound, while the country’s stock market plunged as much as 13%, before recovering to a fall of around 10%. And no wonder it caught everyone off guard. Just two days ago Swiss National Bank vice president Jean-Pierre Danthine told Swiss tv the bank was ‘convinced that the cap on the franc must remain the pillar of our monetary policy’. But actually, it was pretty inevitable, with the European Central Bank expected to launch a program of quantitative easing (QE) next week. Investors already saw Switzerland as a safe haven from Eurozone turmoil, but a flood of cheap money from QE government bond buying would only put more downward pressure on the euro compared to everyone else. 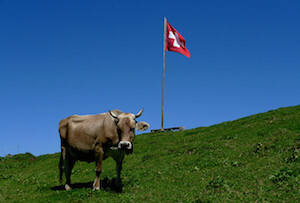 It was, as Jeremy Cook, chief economist at international money transfer company World First, put it, ‘a complete capitulation’ by the SNB, and one that will weigh heavily on Swiss exports – more than half of which go to the Eurozone. Eventually, the markets should right themselves as everyone gets used to the new normal. But for now, expect toblerones, raclette cheese and Swiss watches to get even pricier.